The sun is shining on South Africa. South Africa is home to the 2010 World Cup. And the world it getting a glimpse of a South Africa they may never have seen...or heard before. Have you been watching soccer's World Cup? Of course you have...viewership in the States has doubled since the last Cup four years ago. If you have, you know about the vuvuzela controversy. If you haven't, you should tune in to see just what I'm talking about. A vuvuzela is not a lady's hoo-ha. No, no, no that's something else altogether. A vuvuleza is a plastic one-note horn. And do fans blow them when there's a goal or a fabulous play? No. No? That's right they play them constantly from the opening minute throughout the game and into extra minutes. To the viewer it sounds like your watching, or listening to, a giant bee-hive. Oh, and it's very, very annoying. They are annoying to the point that there have been discussions about banning them. Players have complained that the noise is constant, deafening and it puts them off their game. 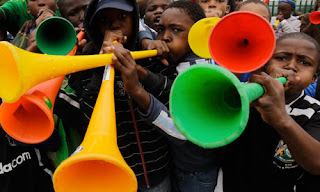 The vuvuzela is not unique to South Africa. If you listen carefully you'll hear the odd honk at a baseball or football game. But what is unique is the sheer number of them at each match. And the sound that sheer number makes. It's as if those people doing the honking never take a breath. It's unbelievable. As a result, there's no passion in the game. There's no "oooh" or "aaah" over a great play. There's no explosion of "yaaaahh" when there's a goal. There's no chanting, clapping or singing. Just this bloody, constant "mmmmmmmmmmmmmmmmmmmmmmmmmm"
It's like the song "Flight Of The Bumble Bee", except played on a trumpet with one note...and the trumpet player's on steroids! Soccer will never be the same. Did I say the sun was shining on Africa? If you want my opinion you can take your bloody vuvuzela and stick it where the sun don't shine. An earlier version of this post first appeared on Sound Off To America. Ha! I read this at Sound Off - you nailed it like a bee sting. It does sound like a beehive and it's bloody annoying. I also remember these horns from the CNE - ack! I hated them. 00dozo: Yeah these horns aren't new. I remember them at CFL games. But there at least not every bloody person in the stadium had one, nor blew them incessantly. Actually, I think that lone note is a b flat...in case that makes it more annoying. As far as American viewership doubling, that would mean that there have been at least 12 people tuning in to listen to the vuvuvelas. Don: Yeah, not a lot of Americans are into soccer. Probably even less accompanied by vuvuzelas! UR: Sorry, eh. Those horns, by the way, are out of "pitch". Get it? ...out of pitch/soccer pitch. Oh sometimes I just slay myself. I should be red-carded for being so funny. OMgawsh. We own one of those annoying vuvuzelas! I hang my head in shame! The boys annoy me with it with just one or two blows, I can't imagine an entire game. AT least not til I clicked on the video. If they ban them, at least people won't be able to smuggle them in. Too dang big! I have to laugh - I'm watching the US v. Slovenia game and, granted, some of the slavic names are hard to pronounce, but one Slovenia player has the unforntunate name of Jokic ("yokich") which, at times, is pronounced by the commentator as, "Jock itch". Quirks: I've got some time on my hands so I've been watching most of the soccer. I swear I go around the rest of the day with a buzz in my head. Word verification today is atiffle.... 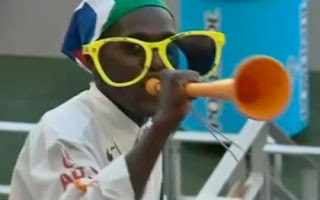 I thing that's a brouhaha that occurs between vuvuzela players when they try to out-vuvuzela each other. A Vuvuzela is not the dirtiest thing you can blow, but it is the dirtiest-sounding thing you can blow. Highly irritating, and yet another reason not to watch the World Cup. Boom-Boom: It's bad enough on TV. Imagine the sound if you were actually in the stadium. People selling ear plugs must be making a killing. Mike: Like Boom-Boom says, you can always turn down the volume. The commentary is done by just one guy talking to himself anyway. At times that's equally annoying as the vuvuzelas. Ha, The Onion's done a piece about music fans being upset that a soccer game broke out at a vuvuzela concert. I couldn't watch more than 11 seconds of it. And, another good reason for me not to watch the World Cup though it explains what all that noise is in my neighbor's garage. Jen: Your neighbour's car horn sounds like a vuvuzela? Wow. It sounds like a swarm of mutant angry hornets. I'd heard about this on NPR but hadn't seen one til now. I'm a brass player (french horn) and I think it would be fun to try one of these, just to see if I could produce anything approaching REAL music. Or at least something not quite as annoying as this. That, plus the fact that it would allow me to put "Vuvuzela" on my resume. My boss would be proud. Janna: Please, please, please...stick to the French horn! I knew what they sound like, I've heard them on TV and on radio and in my head after I heard them on TV and on radio and STILL I pushed play. According to Darwin I should be dead already. Ziva: You just don't know when enough's enough, do ya?